As a major nosy parker I love to read Whats In My Handbag posts, but I realised that I had never actually done one myself! As I just got a new handbag, and have majorly downsized the amount of crap things that I carry around in it, now seems a pretty good time to do the post! Firstly, the handbag itself! My lovely new bag is the Radley Clerkenwell Zip Top Grab Bag. It’s a chic soft grey colour and made from Sherrington Leather which is quite robust, so it won’t scratch easily and it’s very practical with a zip fastening to keep all of your belongings secure. There’s an inside phone pocket, and a pocket on the front too where I keep items that I need to get a hold of quickly – my phone and my Oyster card usually! I attached my Pom Pom Poodle pom pom to the bag which I just think triples the cute factor and you will see a lot more of this bag and pom pom combo in some upcoming outfit posts too! Something I’ll always keep close by is my phone, I have a rose gold iPhone 6 plus which I absolutely love. I originally had the normal size 6, but after using the 6 plus while I was in America, I got totally hooked on the big screen (it makes Instagram browsing a million times more fun!) so switched over when I got back. If I know i’ll be out for much of the day, I’ll usually pack a mini charger too. This one from Amazon is great as it’s lightweight, gives a full charge and is the size of a lipstick! It comes in Rose gold and pink. Also in my bag is a pair of headphones. These BassBuds headphones are really cute with their pink and gold design, and diamante detail on the bud. They’re always in my bag as I like to listen to some tunes on my commute, or to block any distractions if I need to really concentrate at work! As far as necessities, my purse and oyster card holder (which you can see my Fashion Mumblr business card in!) are both Kate Spade. I am so proud of these two pieces as they were both bargains from the Sample Sale (I list upcoming Sample Sales that I hear of here!) and I paid £25 for the purse, and £15 for the Oyster holder! The gold and pink stripy pouch that you can see is an adorable Emergency Kit which I picked up from the Birchbox Store the last time I visited NYC. It contains so many life savers, such as fresh breath spray, plasters, clear nail polish, safety pins, mini sewing kit etc! Beauty wise, I am trying to cut down but I currently keep my makeup essentials in my Charlotte Tilbury makeup bag (not in the picture) which is a great size, but can be squashed down when you want to squeeze things into a smaller handbag. The products which I carry around with me everywhere include the Bourjois Silk Edition powder which I recently reviewed in my Perfect Pairs post. It’s really compact, and has a little sponge inside along with a mirror in the swivelly lid, making on – the – go touch ups easy peasy! Also in there is a Clarins Instant Light Lip Balm, I just love them for their pretty shades and adorable packaging! I usually carry a tester pot of whichever foundation I am loving at the time (right now its the Rimmel 25 hour foundation) and this Hourglass retractable foundation brush which is so handy for afternoon top ups (which actually I rarely need to do when I wear the rimmel!) If you don’t fully retract it, you can use it as a buffing brush too. The light pink tube is a mini perfume spritzer which they were handing out for free in the Lincoln Centre at New York Fashion Week. It’s really handy as you just push it onto your favourite perfume (after removing the silver spritzer nozzle) and press it to fill it with your fragrance. I used to carry loads of the little tester tubes with me, but it’s better carrying this as you are topping up your fragrance, instead of spritzing on a different one!! I usually carry around some essentials like tissues, hand sanitiser and of course my house keys too – things like this tend to lurk around in the bottom of my handbag next to the chewing gum and old receipts and train tickets! Even having downsized my handbag recently, it’s pretty scary to think how much all the contents are worth so I’ve been looking into handbag insurance, and discovered Insure My Handbag (who kindly sponsored this post!) who only charge from just £3.99 a month! This is less than I pay for my phone insurance and they cover your phone, your purse, sunglasses and of course the bag itself. Living in big cities always brings a risk of theft, so it’s a weight off my mind knowing that my bag and it’s contents are covered from theft and accidental damage, and even my most expensive handbag would be covered as they cover bags up to £1500!! 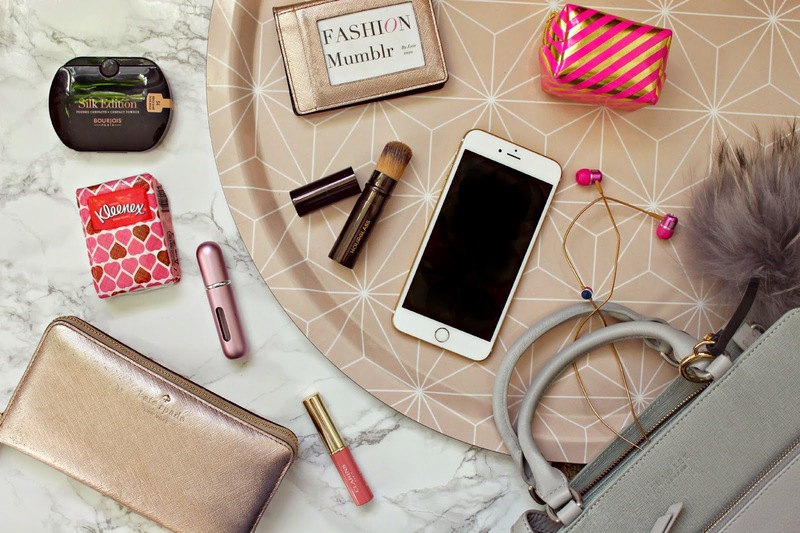 I hope you’ve enjoyed this little nosey into my handbag, and if you’ve done a post like this then leave your link below as I’d love to see What’s in Your Handbag too!